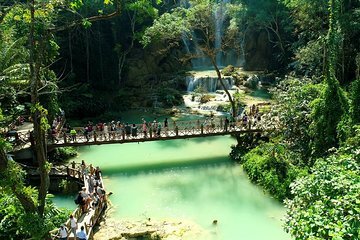 See the best of Luang Prabang and its natural surroundings on a full-day tour that’s ideal for visitors with limited time. As well as exploring the UNESCO World Heritage Site of Luang Prabang on foot, you’ll tick off Kuang Si Falls, the Royal Palace Museum, and the Traditional Arts and Ethnology Centre. Plus, rather than navigating unfamiliar roads yourself, you’ll be transported between attractions in air-conditioned comfort.